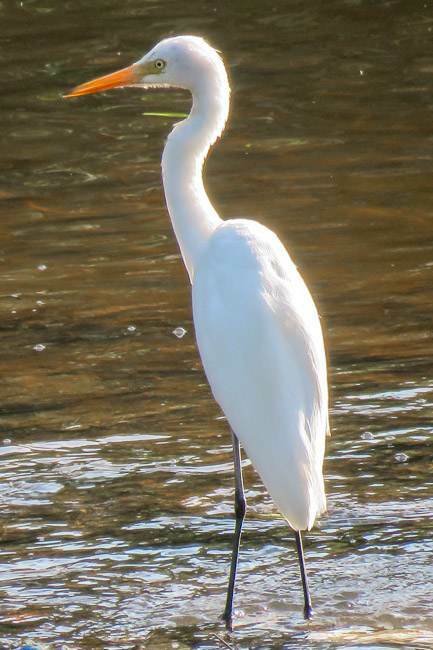 Because of their all-white color, there’s never any doubt that a bird is an egret. But Thailand’s five egret species are all quite similar in appearance so you have to remember certain distinctive features to tell them apart. Luckily, if you have a clear view it’s usually quite easy to do so. Remembering is the hard part, which is why I made these notes. Little, Intermediate, Great, and Cattle egrets are most common in the Central Plains around Bangkok where they stay year-round. In the rest of Thailand they are usually only seen from about August through May. The Chinese Egret is a very rare visitor, and only along the southern coast. 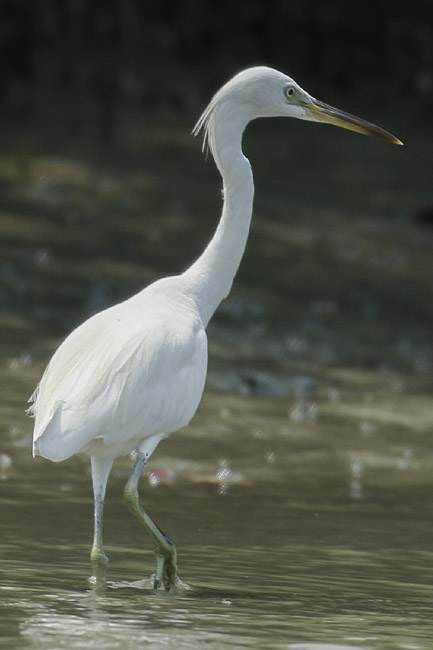 The most common and widespread egret in Thailand. Their black bills and black legs make Little Egrets the easiest egret to identify. Very sociable and often stay together in small flocks. Breeding – Grows nape (two long plumes – the other three common egrets do not have neck plumes and the Chinese Egret nape plums are shaggy), back, and chest plumes. As the name suggests, the Intermediate Egret is between the Little and Great size-wise. Its neck is about as long as its body and it lacks the neck kink that the Great Egret has. Also, its bill is shorter and head thicker than the Great. Breeding – Bill can turn partially black, mostly on upper mandible. Grows back and chest plumes. The Great Egret is the largest of the bunch. 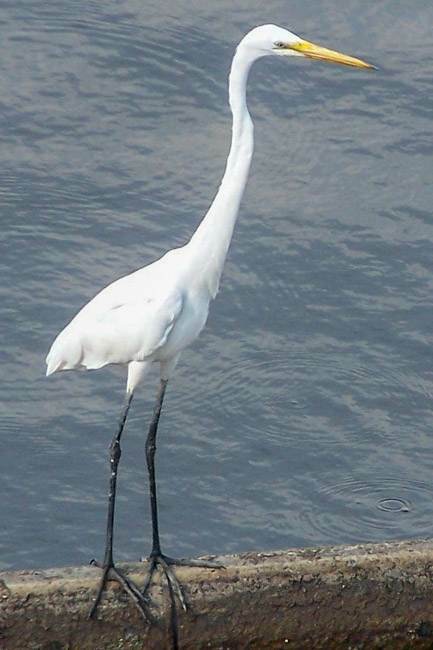 Its neck is one and a half times the length of its body, much longer than the other egrets, and is significantly more curved than the Intermediate with a distinct kink visible when its neck is not fully extended. An easily noticeable line extends from the bill to well past the eye. Breeding – Bill changes to black, legs and sometimes feet to red, facial skin to vivid blue-green. Grows back and chest plumes. 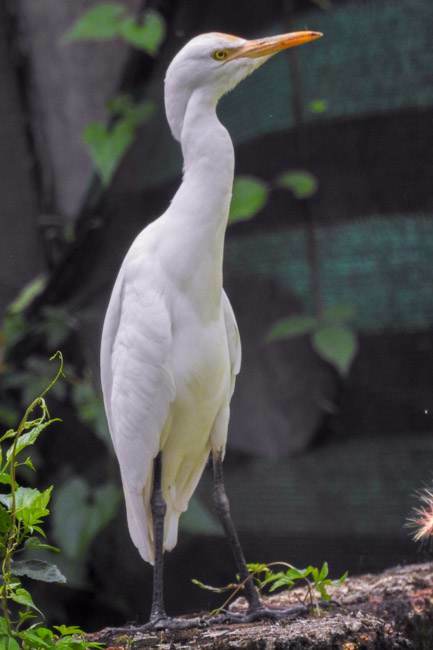 The smallest of the egrets, with significantly shorter neck, bill, and legs relative to the others. The neck is not only shorter, but also thicker and cattle egrets frequently sit hunched with its neck completely tucked in. Aptly named, cattle egrets spend much of their days near cows and buffalo (and nowadays tractors) eating the insects (primarily locust, grasshoppers, and crickets) and other small animals (they eat many frogs when nesting) they stir up. Despite the reputation, they rarely pick ticks off animals. It’s the only egret that regularly feeds in pastures and grasslands, though it can sometimes be found in wetlands and the other egrets will occasionally visit pastures. Often seen in large groups. Breeding – Head, neck, and back turn rusty-orange. Bill, legs, and feet briefly turn red. Grows nape, back, and chest plumes. Similar in size and appearance to the Little Egret, though the feet and legs are a dead giveaway. 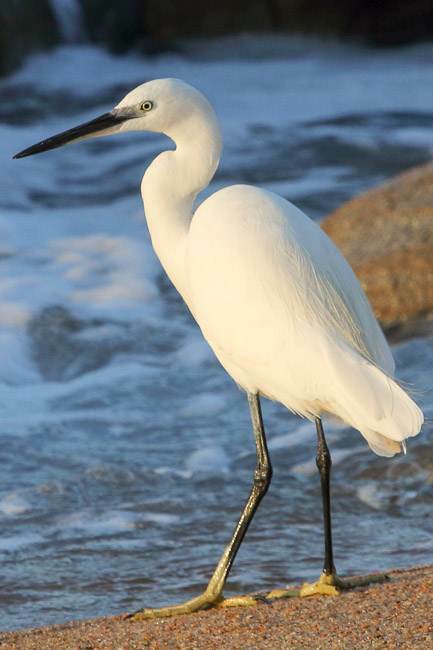 The Pacific Reef Heron (Egretta sacra), which also is found only along the coast, usually can’t be confused with an actual egret because of its dark grey color, but it has an all-white “adult white morph non-breeding” form that looks very similar to the Chinese Egret. The two can best be separated by the Pacific Reef Heron’s yellower legs and thinner neck. Breeding – Does not breed in Thailand. Little Egret photo by Alandmanson from Wikimedia Commons. Intermediate Egret photo by Selvaganesh17 from Wikimedia Commons. Great Egret photo by Kclama from Wikimedia Commons. Eastern Cattle Egret photo by Afsarnayakkan from Wikimedia Commons. Chinese Egret photo by TonyCastro from Wikimedia Commons.